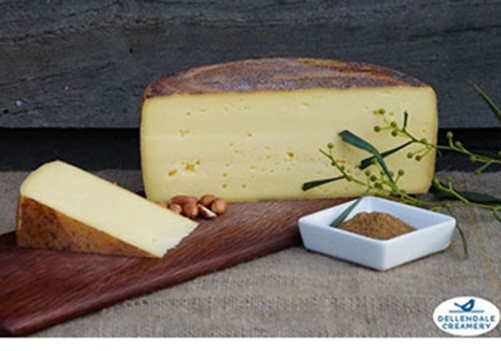 Our passion is to produce and enjoy firmer alpine-style cheeses. We respect the heritage guidelines of traditional recipes, and inject our own style inspired from the milk and surrounds of Denmark, W.A. Our approach aims to incorporate Australian flavours, adding native herbs and spices to the cheese through infused washes and sometimes as a flavour bomb inside the cheese. We don’t forget staples of the Australian diet, also producing fresh cheese dips, classic soft white-moulds and our semi-firm Shadforth Tilsit and Churchill Rd Raclette. We use traditional artisan methods of hand labour to process the milk, cut the curd, wash and turn cheeses, and monitor curing and affinage. We ripen our cheeses in our climate-controlled cellars until they are matured and ready to eat. Our firm to hard-cooked cheeses are aged for 6 months or more. Due to our strong oversight of quality that is possible with the relatively small volumes of our factory, we are keen to experiment and trial new ideas. Please feel free to contact us to discuss tailor-made cheeses. For bulk orders please contact our distribution agent in WA, Crump Agencies.